Just a few weeks ago, Weave, the super slick RSS news reader, received a major UI overhaul which we gave high marks due to its exceptional elegance. Now, v3.1 is available in the Marketplace (paid version) and it's all Mango outfitted for your pleasure. For Mango features, you have your fast app switching/resume, which allows multitasking to finally be enabled. On top of that, the app is smoother for scrolling and quite zippy to use. 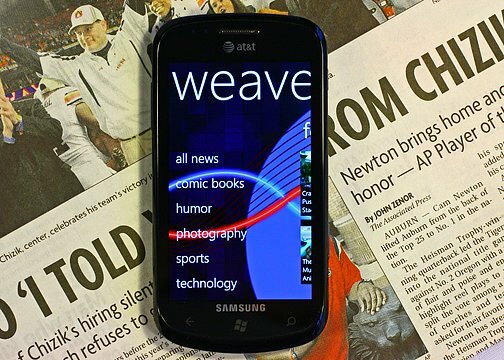 If you haven't tried Weave yet, you really should. One of the its best features are the 33 preloaded categories e.g. politics, technology, Windows Phone, etc. with each category featuring some of the best blogs and news sources around. In turn, you don't have to sit and think about which RSS feeds you should subscribe too (though of course you can manage those and even add new ones). There's a free version (currently non-Mango) and the paid version (with trial) which fetches for $2.99. Grab the Mango v3.1 here in the Marketplace.